I am experimenting adding MIDI controls to a slide trombone. Am using a Sharp IR sensor GP2Y0A02YKF0F with a modified DigiTalent hand Theremin controller, but there is no note off signal unless the target (trombone slide) moves out of range. I would like to think I could add a note on/off switch with a Brain Jr, but it would be even better if I could wire the Sharp IR sensor directly to a Brain Jr. to generate a full range of MIDI notes. Is this possible? A second question is if i could use a thumb joystick to control Velocity and/or Pitch. Just to confirm, I am also using an M-Audio MidAir Wireless system, which I assume will also work with the Brain Jr.
Have you tried using the one of the FSR modes for the analog control? Thanks for the prompt reply. 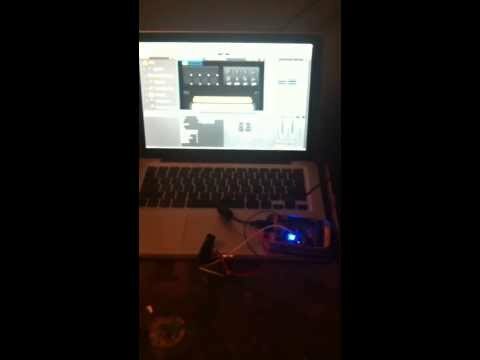 My Brain Jr hasn't arrived yet, but I found a cool video from Livid that shows how to hook up that sensor & use the FSR mode. It works decent enough, but it doesn't seem to sweep out to the extreme ends of the spectrum. Anybody have any clue how to get a more dynamic reaction from this IR sensor? I already have it set to the proper fsr setting from the wiki page. I have used the Sharp sensors a bit, and they make several versions with different ranges. The beam isn't all that wide, so I have used a laser unit from a flashlight track it. You might just tape the sensor to a flashlight for a test, and your video looks like you may be getting a little to one side. When used for MIDI notes, I have discovered that the notes are low really close, then go up to a null as you move away, then back down again over a longer distance. Without a guide, it's easy to stray from the beam freehand. I use a Sharp sensor to track the slide movements of my trombone and have posted some pics and a schematic of the 10k pots I use to trim the affair at Highly Liquid <http://forum.highlyliquid.com/showthread.php?p=7551>. Depending on what you want to do, you might have to make a simple little amp to increase the signal, but do some research so you don't overpower the Brain Jr. Have fun! That looks like a cool setup. The IR sensor was more of an experiment just to see. I may decide to use it in the future, but I've got a couple other things I want to do with my Brain first. I might look into the amp idea. Thanks.